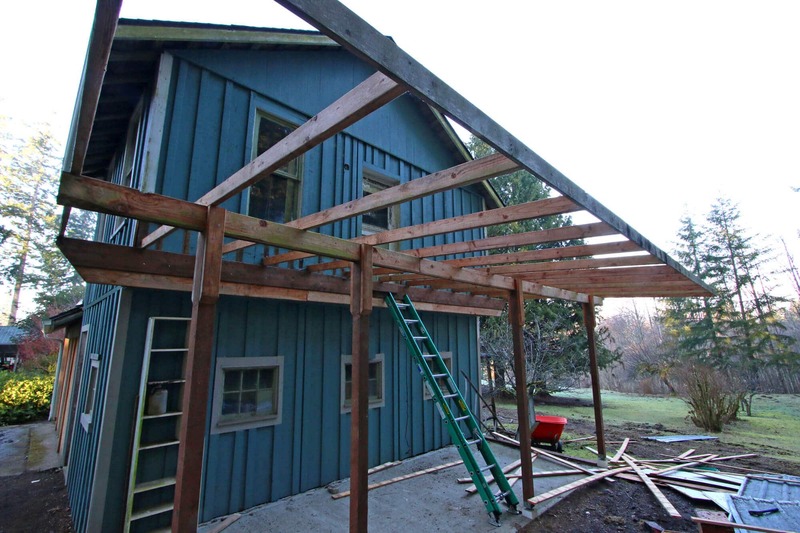 We purchased our 105 year old farmhouse a little over a year ago and have been working on remodeling one of the outbuildings. Welcome to the 7th installment of The Micro-Dwelling Project wherein we’ve single-handedly remodeled a tiny guesthouse on our property from the studs up! To see how far we’ve come (you really have to see it to believe it), check out the first 6 installments. 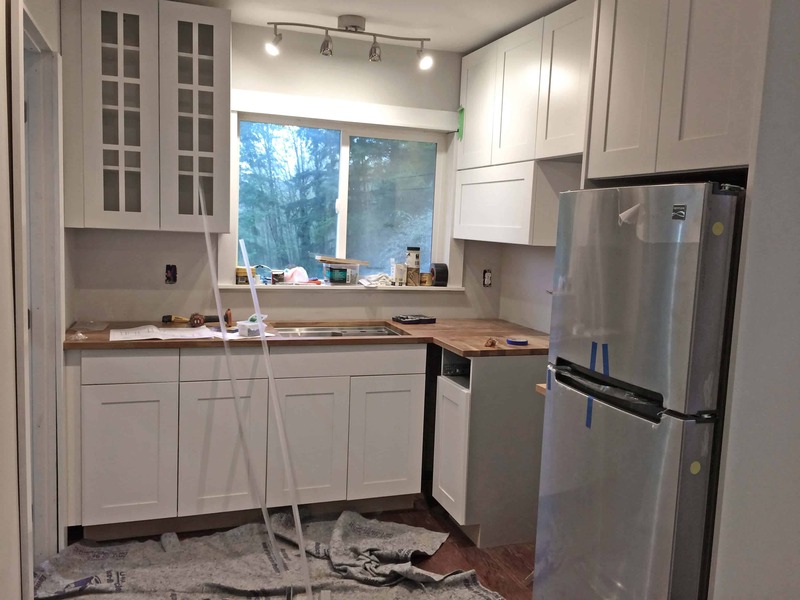 We still have a little bit of work left to do and a couple more installments to come, but today’s post celebrates the completion of the portion we have (as have many of you) been the most excited about: The Kitchen!! Below is with everything gutted. 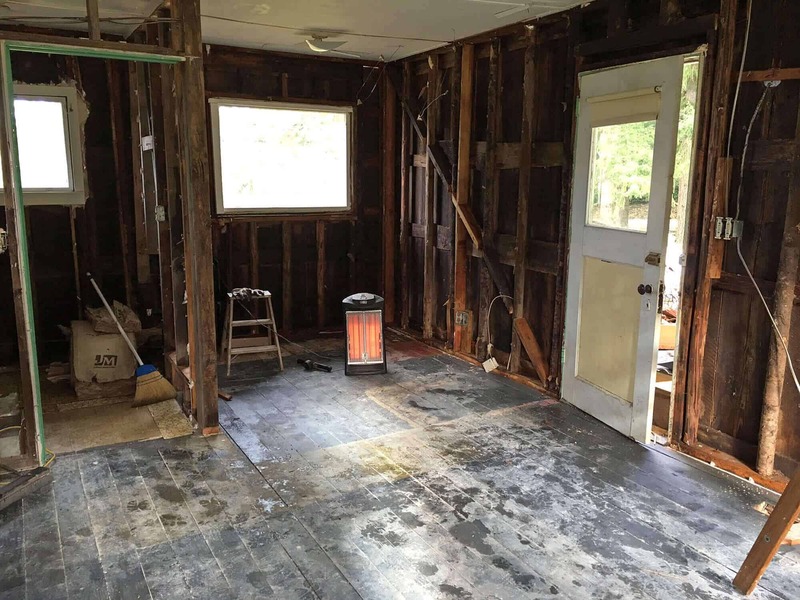 But that was just the beginning – before we ripped out the whole ceiling, door, windows, tore out and rebuilt the kitchen and bathroom wall frames, etc. Do you have these images firmly imprinted in your mind? 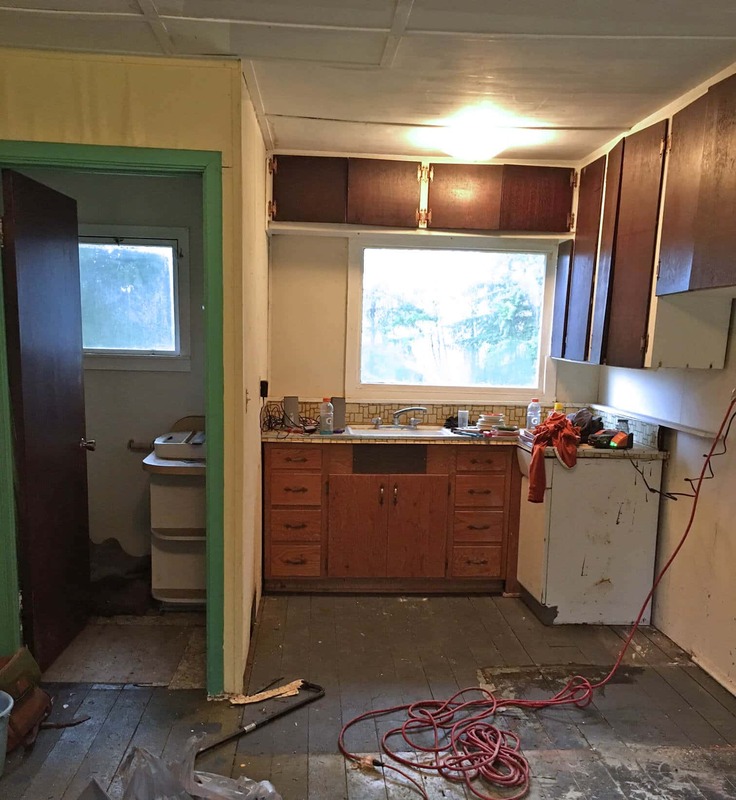 Okay, then let’s continue with the kitchen remodel! Which kitchen cabinets to go with was the very first decision we made when we decided to remodel our tiny guesthouse. We researched options but the decision was too frustrating to make on our own. So we consulted with a friend of ours who has been a kitchen designer for over 20 years and owns his own business. He told us that he has worked with many cabinet brands over the years and now only carries Bellmont, the brand he recommends above all others. He told us they are an unbeatable value for features and quality. We took his recommendation and are glad we did. Bellmont Cabinet Co. is a family-owned cabinet manufacturer located in Sumner, Washington, dedicated to product innovation, functionality, and timeless & trend setting styles. They have been building cabinets for over 30 years, specializing in the highest quality frameless cabinets on the market, featuring greater interior storage capacity, unobstructed openings, and wider drawers with the clean crisp look of flush-fitting full-overlay doors and drawers. Today they are recognized as one of the finest cabinet manufacturers in the United States. Bellmont Cabinet Co. has won multiple awards, most recently Best of Design 2017 on Houzz, the leading platform for home remodeling and design. 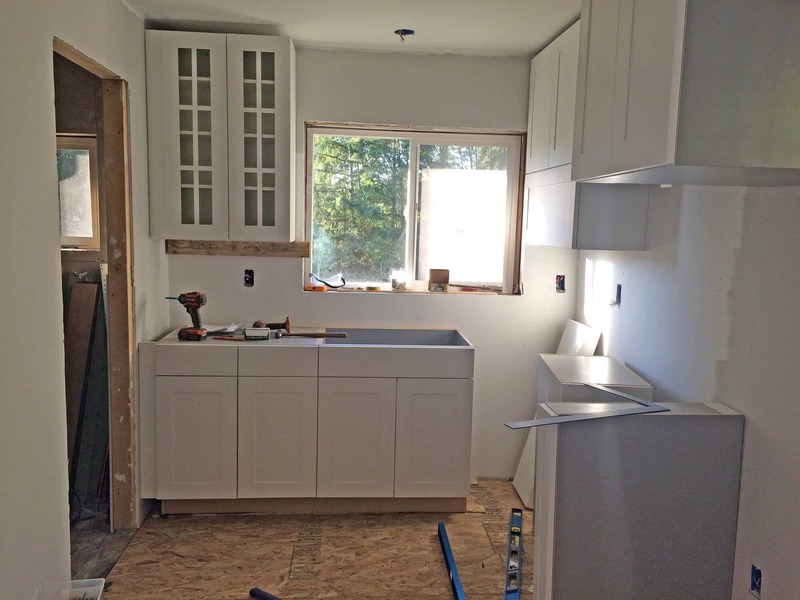 Every aspect of the Micro-Dwelling Project remodel we’ve done ourselves and the same was true of the kitchen, short of the cabinet design, though we did offer input as to what we wanted. 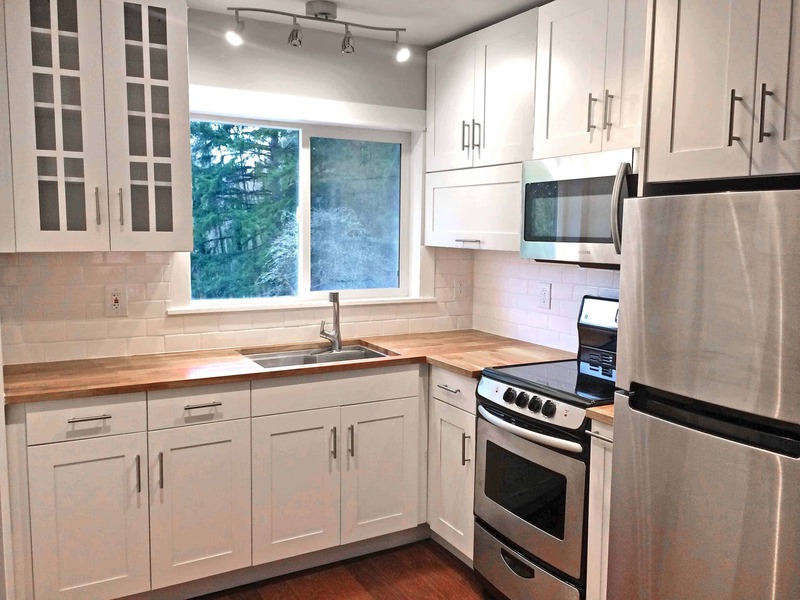 The goal was to maximize as much cabinet space as possible in the tiny 45 square foot kitchen. To achieve that we had to get small appliances – a 24 inch range and 25 inch wide refrigerator – and we had to eliminate a dishwasher altogether. It was either that or sacrifice much needed cupboard space. In the end we decided doing a few dishes never hurt anyone. We chose Bellmont’s 1600 series cabinets. The selection of styles, wood, stains, and paint are fantastic. We chose the Index cabinet facing (Shaker style) and went with maple and white paint to brighten up the small living space. We had our kitchen layout and cabinets designed and placed our order. Bellmont had our cabinets finished in about 5 weeks. Located in Sumner, WA, Bellmont is less than an hour away from us, and while they ship to dealers nationwide, living so close enabled us to save some money on delivery and pick the cabinets up ourselves. I buckled up our kids, hitched a UHaul to the back of our Expedition, and headed down to Sumner. The Bellmont staff was super friendly and it was a quick in-and-out. Before long I was on my way back home with a trailer full of kitchen cabinets and that evening my husband and I carried them up to the guesthouse and got started on them. Todd watched a few tutorials online on how to install kitchen cabinets. It was really pretty straightforward and we had the diagram of our kitchen cabinet design as a visual to follow. First we drew a level line at the point where the bottom of the upper cabinets would come to. Then we screwed a board into the studs that would serve as a support beam to hold the weight of the cabinets while we installed them. 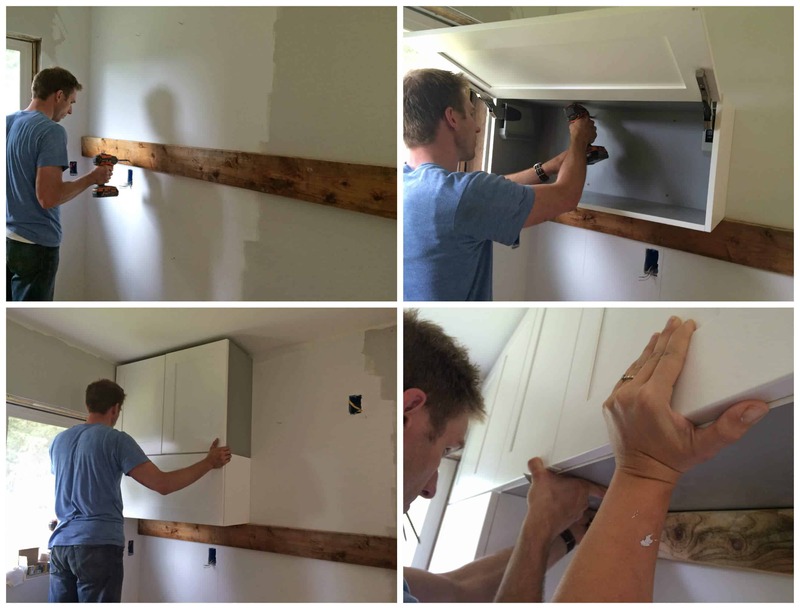 Installing the cabinets was a relatively quick and easy job. With the two of us at it, the job took the better part of a day. The next task was measuring, cutting and getting the countertops installed. We were originally considering granite or quartz for the countertops, either would have been fairly inexpensive considering how little of it we would have needed. But in the end decided to go with butcher block for a couple of reasons: 1) We really liked the blend of rustic and contemporary and 2) we wanted to be able to do it ourselves, something we couldn’t have done with stone. We measured out the butcher block and sawed out a section for the kitchen sink. That was one of the most nerve-racking projects of the entire remodel because it had to be cut perfectly. 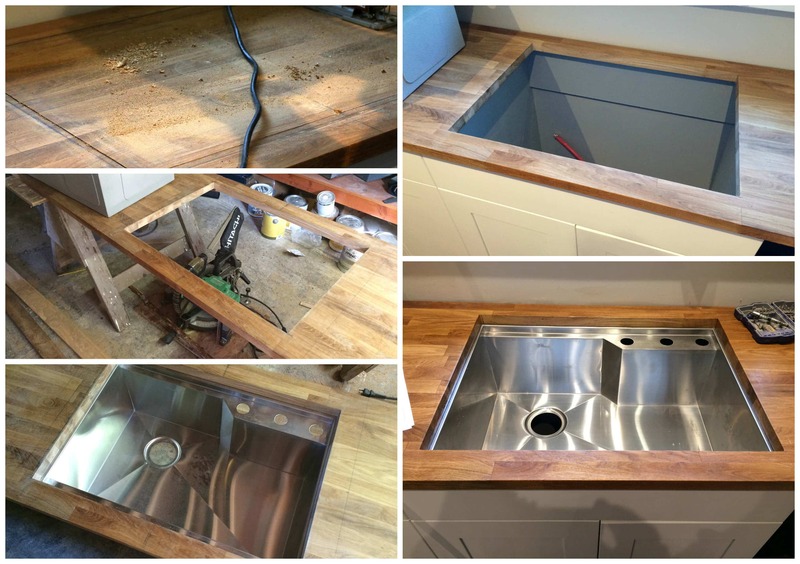 There’s no hiding any mistakes in the cutting for an undermount sink. And if we messed it up we’d have to buy an entire new piece of butcher block. Fortunately we got it right on the first try. Things were starting to take shape beautifully! Let’s take a closer look at the kitchen cabinets. Bellmont’s cabinets emphasize structural integrity and durability that are meant to withstand the rigors of every day use. Their cabinets are frameless which creates more interior storage space and makes them more accessible with unobstructed openings. 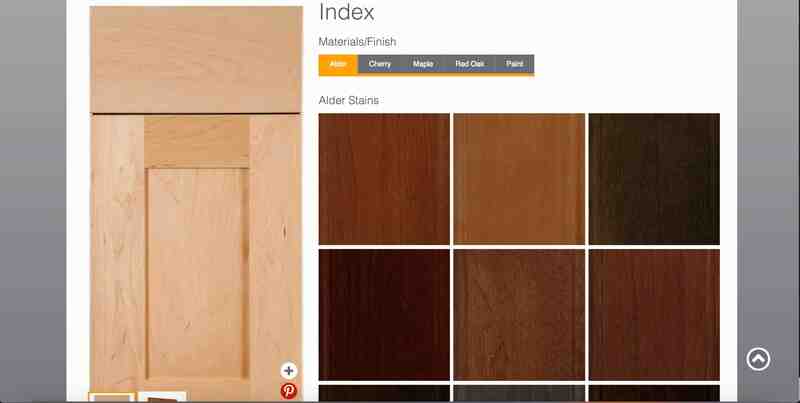 They’re designed with a clean, crisp look of flush-fitting, full overlay doors and drawers. The drawers have dove-tailed joinery for added durability and all drawers and doors feature soft-close slides or hinges. No matter how hard we’ve tried slamming them, the hinges are powerful and are fully able to resist our attempts. The cabinets come standard with white interiors but we opted for gray for some contrast and to add a contemporary element to the look of our kitchen. A very nice, space-saving feature are these pull-out drawers. They’re large and very deep, providing much-needed storage space for this tiny kitchen. They glide in and out very smoothly and quietly, providing easy access to whatever may be stored at the very back. My personal favorite space-saving feature is this little cabinet below. In the kitchen design there would have been six inches of dead space between the range and refrigerator (you can’t have the range right next to the fridge because of the heat). Rather than let that space go to waste, Bellmont built a spice and condiment cabinet for us. It’s the perfect size for spice jars, vinegar and oil bottles. It glides in and out seamlessly with the same soft-close feature as all the other cabinets. It’s awesome! The next project was tiling the backsplash. We really didn’t want to do it because it’s time-consuming and an all-around pain in the backside. 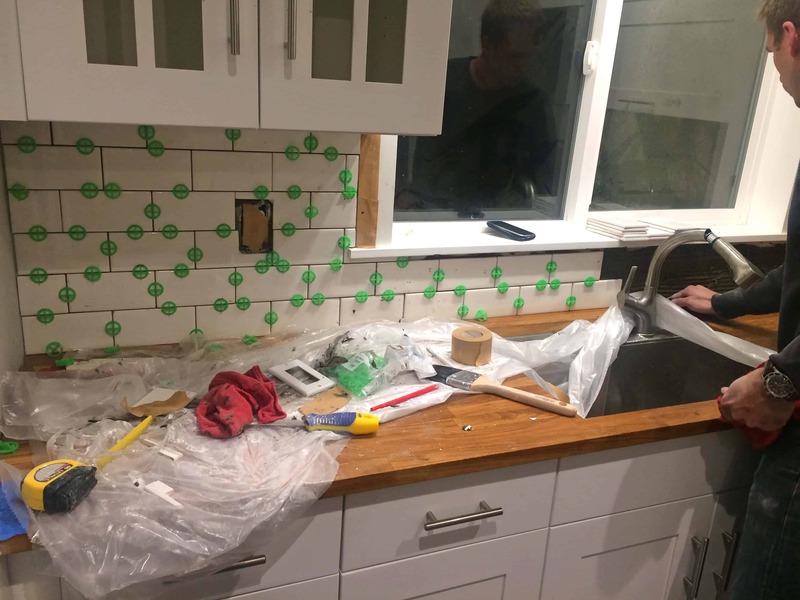 We tried to find an easy way out, looking at stick-on backsplash options. Not only were they ridiculously expensive for what they were (c’mon, they’re plastic stickers! ), but they were ugly as sin and looked equally as fake. So we had no choice but to cave and just do it ourselves. In the end we’re glad we did because it looks great. But it was tedious work cutting all of those small tiles. 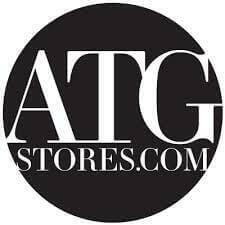 We were very particular about the look we wanted and found everything we needed at ATGStores.com. Selection – For everything related to home furnishings, home organization, outdoor & garden, and more, they’ve got it. Price – They cater to a wide range of budgets, offer student & teacher discounts, and regularly have sitewide sales (including a 15% off coupon when you sign up for their email). Plus everything comes with free shipping. They also have an amazing Best Price Guarantee: If you find a lower price on an identical in-stock item at any other online store they will match it – and then beat it by 10%. User-Friendly – We love the way their site is organized; it’s visually appealing, easy to navigate and find what you’re looking for. Extras – From the ATG Blog, Learning Lounge & Article Library you can gets tons of tips and ideas for home improvement and home decor. You can also sign up to receive custom services from a professional interior designer based on your style and budget. ….and they’re also based right here in Washington! For our kitchen cabinets we wanted hardware that was simple, sleek and contemporary. The Hafele Stainless Steel Handle Pulls were perfect. Aren’t those awesome? Next came the sink. Because this kitchen is so small, we had the cabinets along the wall of the sink made to a depth of 21 inches instead of the standard 24 inches. Had they been standard depth it would have compromised the cabinet space along the other wall, so we had no choice but to make them shallower. That made finding a sink very challenging since most were either too big or too small to function as a kitchen sink (think wet bar sink). Fortunately ATG Stores had exactly what we needed, not only in terms of size, but also style. We found the Dawn Zero Radius Dual Mount Stainless Steel Sink, which is unique in that it can be installed as either an overmount or undermount sink. Most overmount sinks tend to be less sleek but this one was has a nice contemporary look. We also like that the faucet is mounted off to the side rather than in the middle because it helped center the faucet with the window to create a balanced look to the kitchen. Also helpful was that this particular model allowed us to mount the faucet to the sink itself rather than in the counter behind the sink (as you can see, there wouldn’t have been room). We thought the Kohler Elate Pullout Kitchen Faucet looked particularly cool in this kitchen (wait till you also see it from a distance), enhancing the contemporary look and feel with its distinctive shape and sophisticated design. It’s very ergonomic in its design, has a pullout sprayhead, and with the touch of a button switches from an aerated stream to a powerful spray to a pause function. 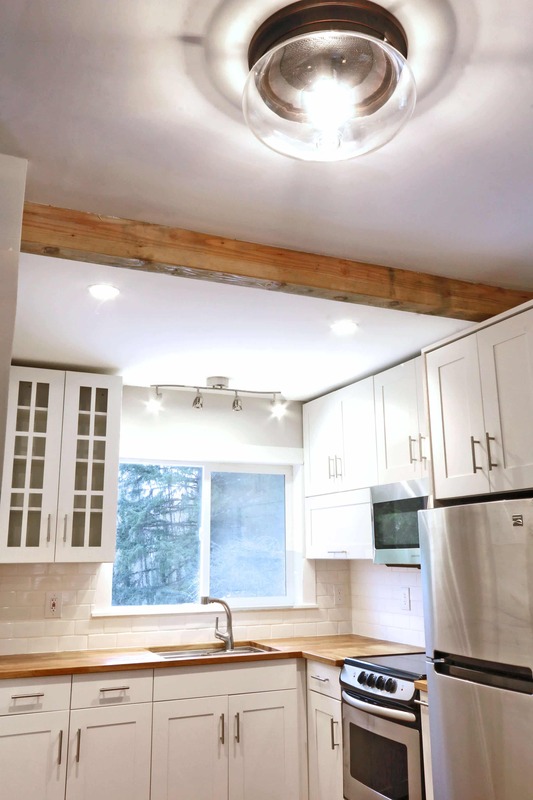 In addition to the recessed lights we put in the kitchen ceiling, we wanted to put a stainless steel track light above the sink to match the look of the appliances. We chose the sleek-looking Royal Pacific 4-Light LED Track Light with adjustable heads so we could keep two of them aimed down at the sink and the other two pointed in towards the kitchen. For our entryway light that sits in between the kitchen and living room we deliberately went with a very different look: The Jeremiah Lighting Yorktown Flush Mount Ceiling Light. Todd was pretty excited when he found this on ATG Stores. Throughout this remodel project we’ve wanted to create a contemporary look while adding some vintage elements like the doors, door trims, window casings and leaving the original weighted windows in the living room. This Jeremiah ceiling light is reflective of the same era as our main home, built in 1912. So it was the perfect touch to tie both worlds together. We just love the clean, contemporary look of Bellmont’s cabinets coupled with the hardware, lighting and fixtures from ATG Stores. We’re planning on remodeling our main kitchen before too long as well and this has given us some great experience. When the time comes we plan on using Bellmont cabinets and look forward to equipping that kitchen with some great selections from ATG Stores. Isn’t this kitchen simply stunning?!! Once again, this project was a long time coming but our hard work has really paid off. We look forward to welcoming family and friends to this place and I also plan on using it as an extension for my blog work for photo and video shoots. For more information about Bellmont Cabinets, visit their website or find a dealer near you. For everything related to home furnishings, home organization, outdoor & garden, and more visit ATGStores.com. STAY TUNED FOR THE NEXT INSTALLMENT OF THE MICRO-DWELLING PROJECT! A special thank you to Bellmont Cabinet Co. and ATGStores.com for partnering with us and to my readers for supporting the brands that make The Daring Gourmet possible! Absolutely incredible!! You guys are AMAZING and this kitchen does look absolutely stunning!!! Love all of your choices from the cabinets to the hardware – well done!! W.O.W. 😍 It’s the kitchen of my dreams!!! Can you tell me which refrigerator you chose? Thanks, Wanda! :) Yes, we chose the Kenmore 10.7 cubic foot fridge (24 inches wide, 60 inches tall) because it had high reliability ratings and was one of the best values for a small refrigerator. Thank you! Yes, bright, cheerful and contemporary was the look we were after. You did an amazing job! Beautifully done. I’m glad you went for the real backsplash. Those sticker ones aren’t for me either! So are we, Christine! Way more time-consuming but 100% worth it. Everything looks absolutely great. May I ask what you did with the corner to the right of your kitchen sink? Did you sacrifice that space, or is the cabinet to the right a 1/2 circle lazy susan? Thank you! :) We explored options for that space but in the end just had to sacrifice it because the cabinet next to it didn’t allow for enough space/clearance for the lazy susan. The only option would have been to knock out the right cabinet wall of the cabinet under the sink, but then trying to access that space would have been completely impractical anyway. It is gorgeous! I can’t believe the transformation! WOW! I’m loving the cabinets! those glass panels are amazing. So do we, we are so happy with our Bellmont Cabinets!! I just love your new kitchen, especially the counter tops! I’ve been wanting to get butcher block for mine, so I love how yours turned out! Thanks, Dee! They require more maintenance than other countertops but it’s really not much work and we love the way they look, too! Stunning! I am loving the butcher block! Wow, that came together amazingly! It’s awesome how it felt so small before but the design kind of makes the kitchen seem roomy! It’s so true, we’ve been amazed at how the finished remodel of the whole place feels much roomier than it did before. That’s definitely a benefit of lots of white and good lighting. Oh my goodness I am SO jealous (and happy for you!) I am dying to renovate our kitchen, great job!! Thanks, Lauren, and good luck with your kitchen remodel! Our next project is our main kitchen (this one’s the kitchen of our tiny guesthouse), and I’m especially looking forward to the end results of that one! I can’t even imagine how long that all must take! And for the post, too. It looks like it was worth it! It’s gorgeous. It seemed like we’d never get this place done, Erin, and we’re so relieved it’s nearly finished!!! I’m so in love with everything!! That counter is fantastic! I’m in love!! I love your new kitchen – especially the sink, and that was before knowing it was 21 inches and not 24 — now I’m even more impressed! 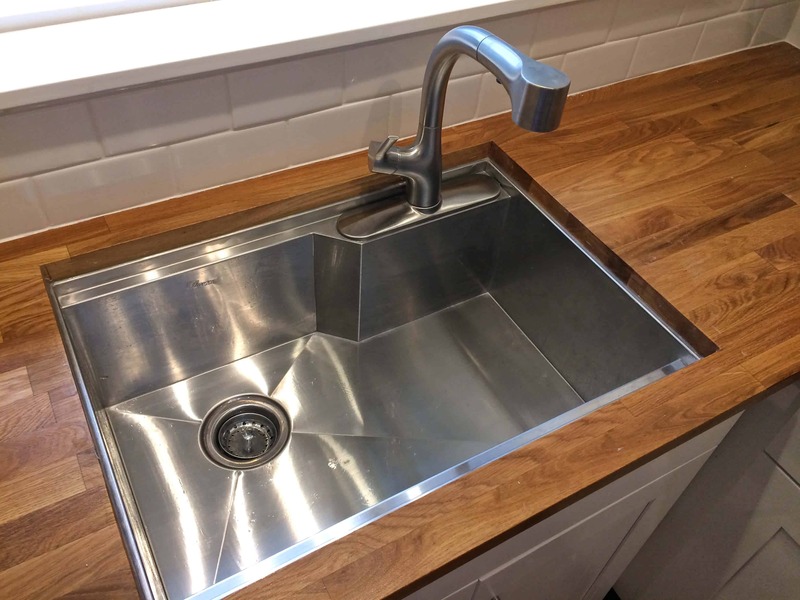 I know, Laura, we were so fortunate to find a sink that not only was the perfect fit but that also looks so nice and sleek – such a great find! It came out GREAT!!! What a bright and clean space – love it. Looks like it’s coming along great! Good luck and be safe! LOVE the end result! You guys are unbelievable! Fantastic job, especially since you did it yourselves! Congrats!! Thanks so much, Christina! :) A ton of work but the end result is so worth it! It looks amazing! Love the counters, cabinets, andlights! Thanks, Dorothy, we LOVE our Bellmont Cabinets and all the great finds from ATG Stores! It came out absolutely gorgeous! I really love the cabinets and the lighting! Wow – that transformation!! Such a gorgeous end result! Thanks, Cathy, we can hardly believe it ourselves! I love how bright and beautiful all the white is! And I especially love the glass panes in the upper cabinets to the left of the sink. SOOOOO cool, and what a giant project :) Seeing the gutted part is always amazing to me! We love those upper cabinets, too, Kelly! Oh my gosh, I know, comparing it with the “before” pics is almost unbelievable! Wow! The transformation is stunning! I watched my parents go through a kitchen remodel, and I saw firsthand how much work everything was (especially subway tile backsplash!). You guys did a gorgeous job! Thanks so much, Michelle! Seriously, had we known in advance what we were getting ourselves into…yikes. But we’ve picked up so many great skills and the end result made everything worth it. I love, love, LOVE this!!!! 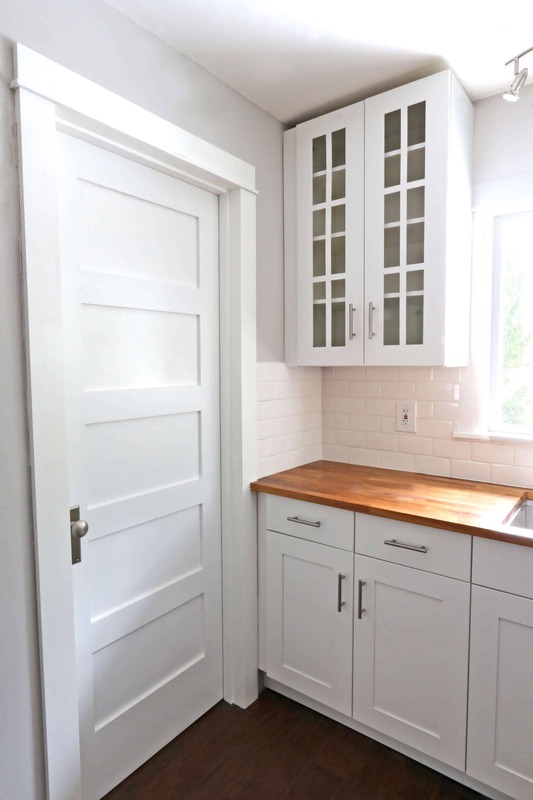 The Bellmont cabinets are absolutely gorgeous and I love your choice of hardware, butcher block, and sink – everything goes together so beautifully. And I agree that the Jeremiah light is a great way to tie together the modern look with the historic setting of your main home and property – it’s really neat looking light. This is truly a dream kitchen, well done all of you!! Thanks so much, Cori! :) Everything really turned out perfectly and we are so happy with the results! You guys are miracle workers! It is absolutely astounding what you’ve accomplished by yourselves, especially considering you’ve never done this before. What an inspiration! We remodeled our kitchen 2 years ago but hired out the job. Maybe if I had seen this sooner it would have given us more courage to try our hand at least part of the work :) Your cabinets are gorgeous. I wish I had heard of Bellmont when we did our kitchen. My sister and brother-in-law are remodeling their kitchen this year though and I’ve already forwarded this post to them and told them they have to look into these cabinets you used and also that cabinet hardware (love it). Beautiful kitchen and such an inspiring post along with all the other posts from The Micro-Dwelling Project! Thanks so much, Katherine! :) Good luck to your sister and brother-in-law and if they have any questions about the cabinets, the team at Bellmont are super friendly and will be more than happy to chat with them. It was a pleasure working with you two on your micro-kitchen project. We at Bellmont Cabinet Co., are proud of the product we build. But the real gratification is knowing we have made a difference in someone’s lives. Great job too on the careful and well executed install ! Thanks so much, John, it was a pleasure working with you also. We love our Bellmont Cabinets! Amazing! Those cabinets give so much space in your tiny kitchen! They really do open up the place, Kelly! Stunning indeed! I’ve done a fair bit of remodeling myself so I can appreciate the amount of work and skill that goes into something like this. A+ job! HOLY COW! You guys have worked tooth and nail on this sweet welling! I’ve enjoyed watching your journey thought it! Seriously stunning! I can’t get over what a transformation all of the rooms have had so far!